The Worthing & District Table Tennis Association’s Invitation Cup, held at North Lancing School on 29th May, was won by Sussex Junior & Senior Champion Jack Bennett beating veteran, and six times past winner of this event, Peter Bartram 11-7, 11-7, 15-13 in the final. The spectators, who numbered around seventy, were treated to an evening of top class table tennis. Six invited players took part in the competition which was split into two groups. The Group A winner was Bartram who won both his matches beating last year’s winner Daniel Barna 11-5, 11-13, 11-2, 11-4, and Rory Scott 15-13, 11-9, 10-12, 11-6. Scott also beat Barna 11-8, 3-11, 11-5, 11-8. Jack Bennett came through two tough matches to win Group B. In his first he beat Mark Collins 11-7, 9-11, 10-12, 11-2, 11-9, and then up against his younger brother Josh won 5-11, 11-6, 11-9, 9-11, 12-10. Josh also had a win over Collins 11-9, 11-7, 12-10. It was a good year for the Goring Club with their A team once again taking the Div.1 trophy with 207 points, and their B team winning Div.2 with 170 points. Runners up in Div.1 were Woodlands A on 176 points, and in Div.2 Lancing E on 164 points. West Chiltington, a new club to the league, won Div.3 on 186 points, and runners up were Lancing G on 174 points. 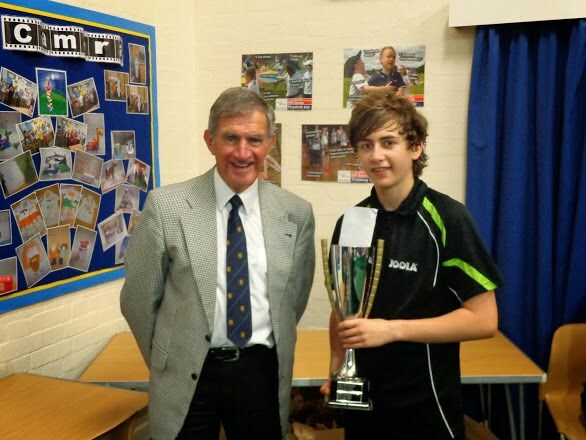 George Green, from the Lancing Club, was warded the Jim Holden Trophy as the most improved junior player.